Next year could be historic for the marijuana industry in more than one way. While multiple states have a real shot at legalizing recreational cannabis via ballot measures in 2016 – including massive markets such as California – one appears poised to become the first to do so via the legislature: Vermont. Two separate bills to legalize recreational cannabis in the state gained little traction this year. But they are both still alive, and there’s a good chance lawmakers will discuss one or both in the next legislative session, which begins in January. The climate for marijuana legislation in the state has also improved noticeably in recent times, boosting the odds that the legislature will pass a bill in 2016. If that happens, marijuana businesses that crop up in the state could generate hundreds of millions of dollars in sales from recreational cannabis, attracting scores of consumers from large states in the region such as New York and Massachusetts. Vermont State Sen. David Zuckerman, who sponsored one of the bills to legalize recreational cannabis this year, estimated in February that his measure had a 50-50 chance of passing in 2015. 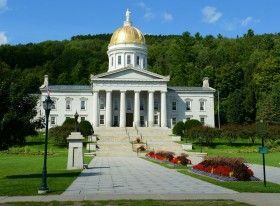 Additionally, the current governor – Democrat Peter Shumlin – has been a longstanding supporter of rec legalization, which gives the matter urgency for him. And at least one candidate who is running to succeed Shumlin in 2016 – House Speaker Shap Smith – has also voiced support for legalization, making it a campaign issue in next year’s gubernatorial race. Both of those factors are expected to push legalization toward the front of the political agenda at the state Capitol. That’s key, as voters have no direct say in the matter. Vermont is one of 22 states that have no citizen petition process for getting a new law onto the ballot. In those states, only the legislature can legalize recreational cannabis. So next year may mark the first time a sitting legislative body approves a system for the production and sale of recreational marijuana (Alaska, Colorado, Oregon, Washington State and Washington DC all legalized adult-use cannabis via voters, not the legislature). “I’m very hopeful – so hopeful that I’m moving to Vermont in a few months so I can be in the middle of it in the next session,” said Matt Simon, the New England political director of Marijuana Policy Project. Simon has lived in New Hampshire for the past eight years, but he sees a historic opening in Vermont that he wants to see firsthand. He wants to be there to help ease the passage of recreational, which could be considerable given MPP’s knowledge of how other states have implemented effective regulations. Zuckerman agreed, adding that while it’s far too early for any real specifics, his bill will likely provide a starting point. “I think it will probably be a different bill, because… the Senate Government Operations Committee actually spent much of the year taking testimony and understanding the lay of the land of cannabis in Vermont right now, using the RAND report as a template,” Zuckerman said, referring to a report commissioned by the state to give policymakers a better idea of the impacts of rec legalization. But, he said, there are key legislators who have been influenced by the report as well as by polling numbers that show Vermont residents are ready for rec. He cited Sen. Jeanette White, a Democrat who chairs the Senate committee which took the testimony on rec, as an important cog in the legalization wheel. “I know Sen. White supports this pretty strongly, and I believe the majority of her committee does, so there’s a good chance that they’ll introduce a bill this fall,” Zuckerman said. White could not be reached for comment on Tuesday. Zuckerman said he anticipates policy debates on areas such as edibles packaging, industry wage standards, product testing, environmental footprint by cannabis companies, appropriate taxes and preventing youth access to marijuana. But he’s hopeful the final product will resemble his initial bill. Lay the groundwork for up to 42 recreational cannabis retail licenses, to be issued by a Marijuana Control Board. Allow either for-profit or non-profits to register with the state as a cultivator, product manufacturer, testing lab, retailer or marijuana lounge. Allow marijuana lounges to sell cannabis and let consumers partake in on-site consumption. Permit local governments to ban commercial cannabis businesses. Ban mass-marketing campaigns that could reach minors. Enforce pricing guidelines to undercut the black market. Permit both indoor and outdoor cultivation. Require edibles to be sold in opaque, child-resistant packaging, and be limited to a single serving. Simon said that the priority is likely going to be building consensus to get a bill passed. There will inevitably be disagreements between stakeholders, he said, and the question is whether those will prove to be deal breakers. •Enforce pricing guidelines to undercut the black market. This will not be possible because the black market has no overhead costs or taxes imposed by the State. The only way to compete with the black market is to allow anyone above the age of 18 to grow their own.